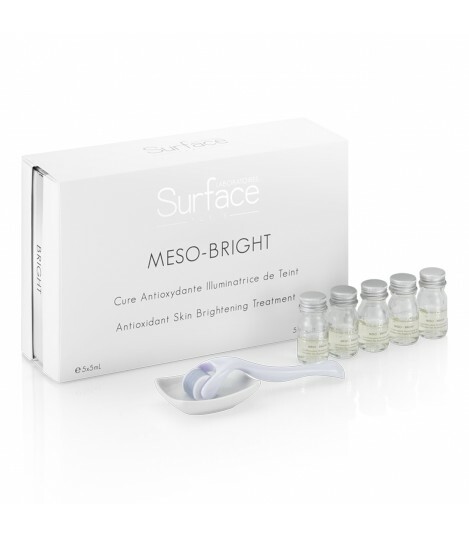 Inspired by the technique of medical mesotherapy, MESO-BRIGHT is an innovative 5-week cosmetic treatment used at home. Enriched with a powerful dose of antioxidants and vitamins, and with the application of the specially formulated Meso-roller by Laboratoires Surface-Paris, it instantly brightens the skin and unifies the complexion. MESO-BRIGHT is a dedicated solution for deep hydration and collagen stimulation of the skin to reveal an even-toned, illuminating skin. MESO-BRIGHT deeply hydrates the epidermis to illuminate the complexion and remove dark spots and hyper-pigmented areas. From the first application, spots and imperfections begin to fade away. When touched, the skin texture appears smoother and softer. Using MESO-BRIGHT every week for five weeks will allow a deep rehydration of the skin and begin repairing fragile tissues. The skin is simply transformed. For optimal results on the complexion, combine the MESO-BRIGHT treatment with products in the Bright Now cosmeceutical line: Flawless Complexion Moisturizing Cream, Advanced Tone Correcting Serum, Gentle Exfoliating Clarifying Soap and Brightening Moisture Body Lotion. This unique formula combines three detoxifying and anti-aging active ingredients, Vitamin B3, Hyaluronic Acid and Brightenyl. Vitamin B3, in the form of Niacinamide, is a very effective skin-restoring ingredient that visibly improves the appearance of enlarged pores, uneven skin tone, fine lines, dullness and a weakened skin surface. Hydrolyzed hyaluronic acid is obtained through the hydrolysis process of the hyaluronic acid, using plant-derived biotechnologies, and because of its low molecular weight, it is able to penetrate the epidermis skin layer more effectively, stimulating the synthesis of collagen and keeping the skin moisturized, compact and elastic. Brightenyl which combines glycerin and gallic acid, restores a perfect and even skin tone by blocking the melanogenesis process and by protecting the skin and preventing its inflammation. Brightenyl’s brightening properties are 4 times more potent than Vitamin C and 60 times more efficient than kojic acid. The effectiveness of these active ingredients contained in the serum is reinforced by the use of the Meso-roller’s micro-needles; which activates its diffusion at the heart of the epidermis. 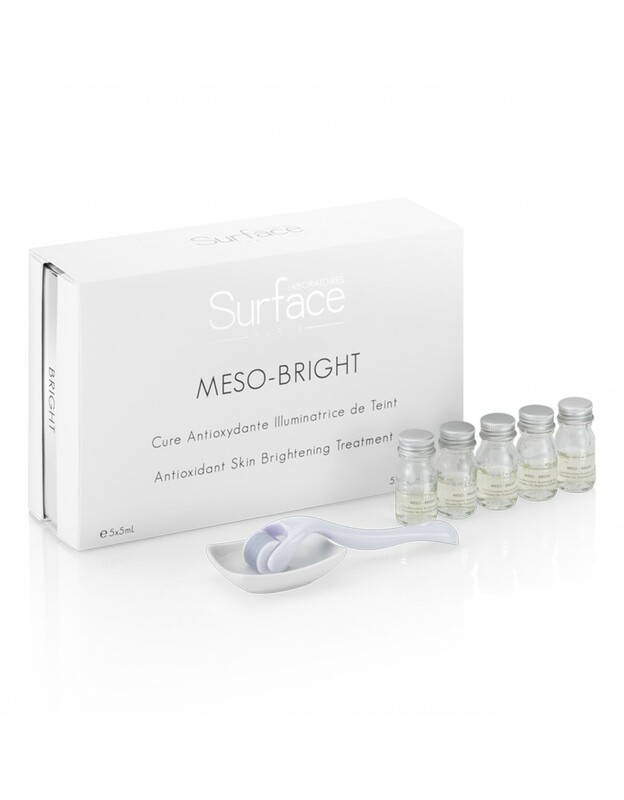 Having powerful detoxifying and anti-aging properties, MESO-BRIGHT is the perfect skin illuminator. J'ai remarqué quelques tâches sur mon visage dernièrement et mon teint était un peu terne. Je me suis donc tournée vers ce produit meso-bright conseillé par une amie. J'ai vraiment beaucoup aimé ses effets: ma peau est à la fois hydratée et plus éclatante qu'avant. Mes imperfections se voient bien, c'est très encourageant.